Purified water is water that is mechanically filtered or processed to be cleaned for consumption. Distilled water and deionized(DI) water have been the most common forms of purified water, but water can also be purified by other processes including reverse osmosis, carbon filtration, microfiltration, ultrafiltration, ultraviolet oxidation, or electrodialysis. In recent decades, a combination of the above processes have come into use to produce water of such high purity that its trace contaminants are measured in parts per billion(ppb) or parts per trillion(ppt). Purified water has many uses, largely in science and engineering laboratories and industries, and is produced in a range of purities. Purified water in colloquial English can also refer to water which has been treated ("rendered potable") to neutralize, but not necessarily remove contaminants considered harmful to humans or animals. Distilled water is produced by a process of distillation and has an electrical conductivity of not more than 11 μS/cm and total dissolved solids of less than 10 mg/L. Distillation involves boiling the water and then condensing the vapour into a clean container, leaving solid contaminants behind. Distillation produces very pure water. A white or yellowish mineral scale is left in the distillation apparatus, which requires regular cleaning. Distillation alone does not guarantee the absence of bacteria in drinking water unless containers are also sterilized. For many procedures more economical alternatives are available such as deionized water and, is used in place of distilled water. Double-distilled water is prepared by double distillation of water. Historically, it was the de facto standard for highly purified laboratory water for biochemistry and, by the method of trace analysis until combination methods of purification became widespread. Deionized water, also known as demineralized water(DI water, DIW or De-ionized water), is water that has had its mineral ions removed, such as cations like sodium, calcium, iron, and copper, and anions such as chloride and sulfate. Deionization is a chemical process that uses specially manufactured ion-exchange resins which exchange hydrogen ion and hydroxide ion for dissolved minerals, which then recombine to form water. Because the majority of water impurities are dissolved salts, deionization produces a high purity water that is generally similar to distilled water, and this process is quick and without scale buildup. However, deionization does not significantly remove uncharged organic molecules, viruses or bacteria, except by incidental trapping in the resin. Specially made strong base anion resins can remove Gram-negative bacteria. Deionization can be done continuously and inexpensively using electrodeionization. 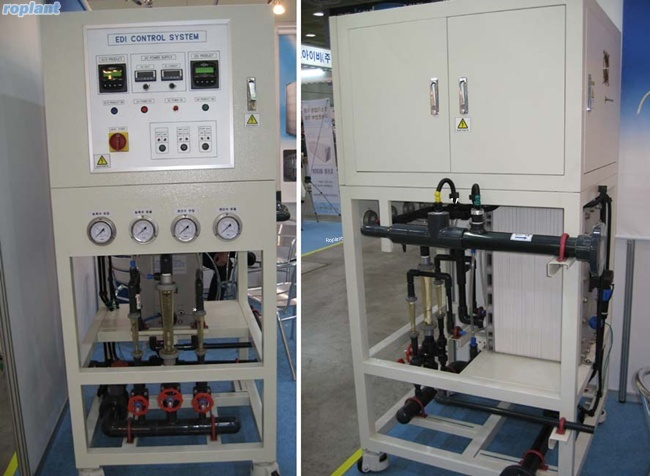 Other processes are also used to purify water, including reverse osmosis, carbon filtration, microporous filtration, ultrafiltration, ultraviolet oxidation, or electrodialysis. These are used in place of, or in addition to the processes listed above. Processes rendering water potable but not necessarily closer to being pure H2O / hydroxide + hydronium ions include use of dilute sodium hypochlorite, mixed-oxidants (electro-catalyzed H2O + NaCl), and iodine; See discussion regarding potable water treatments under "Health effects" below.